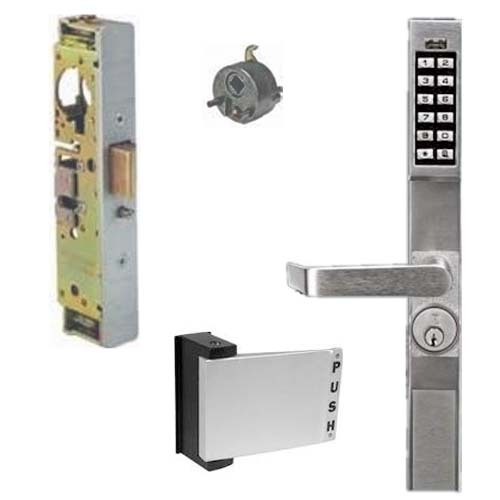 DL1200PPAK Alarm Lock narrow stile electronic pushbutton lock with Adams Rite 4590 paddle & 4900 deadlatch for use with narrow stile aluminum doors. Adams Rite 4590 Paddle & 4900 Latch for use with Narrow Stile Aluminum Doors. Can be used to convert key entry with inside thumbturn, to Electronic Pushbutton entry with Inside Paddle. Can be used to replace deadbolts and hookbolts. Description: The 4560 Deadlatch Handle will easily unlock the 4300, 4500 and 4900 Series Deadlatches..
Adams Rite 4900 Grade 1 Heavy Duty Deadlatch with Flat and Radius Faceplates and Strike is designed ..
4590 Adams Rite Paddle Operator for Adams Rite 4300, 4500 or 4900 Series Deadlatches. A..
DL1200 Alarm Lock Trilogy Electronic Pushbutton Narrow Stile Aluminum Door LockInstallation Packages..
DL1300 Alarm Lock Trilogy Electronic Pushbutton Narrow Stile Aluminum Door LockAlarm Lock Trilogy DL..